Neuroendocrine Neoplasms (NEN) are a group of heterogeneous malignancies derived from neuroendocrine cell compartment, with different roles in both endocrine and nervous system. Most NETs have gastroentero-pancreatic (GEP) origin, arising in the foregut, midgut, or hindgut. The 2010 WHO classification divides GEP-NETs into two main subgroups, neuroendocrine tumors (NET) and neuroendocrine carcinomas (NEC), according with Ki-67 levels. NET are tumors with low (<20 %) Ki-67 value, and NECs, including small cell lung carcinomas and Merkel Cell carcinomas, are all NETs with high Ki-67 levels (>20 %–G3). Poorly differentiated neuroendocrine carcinomas (NEC) are usually treated with cisplatin-based chemotherapy regimens. Here we present a case of a patient with pancreatic NEC progressing after cisplatin and etoposide, treated with temozolomide as palliative, second line treatment. According with the poor Performance Status (PS = 2) and to reduce the toxicity of the treatment was chosen an intermittent dosing regimen of metronomic temozolomide (75 mg/m2/day—one-week-on/on-week-off). MGMT resulted methylated. On July 2014 the patient started the treatment. On August 2014 the patient obtained a significant clinical benefit (PS = 0) and the total body CT scan performed on October 2014 showed a RECIST partial response on all the sites of disease. No drug-related side effects were reported by the patient. After 18 months of therapy the treatment continues without significant toxicity, and with further remission of the metastases. Treatment with metronomic “one-week-on/on-week-off” Temozolomide can be considered a good treatment option in patients with poor performance status, affected by pNEC with MGMT methylation. Neuroendocrine tumors (NETs) are a heterogeneous group of malignancies derived from neuroendocrine cell compartment [1, 2], with roles in both endocrine and nervous system. The treatment strategy of NET varies according with several factors, such as tumor differentiation, stage at diagnosis, and presence or absence of symptoms related to hormonal secretion. Surgical resection represents the traditional treatment of NETs and it is the only curative approach. However, the surgical excision is not always possible because most of the patients are metastatic at the diagnosis, with regional or distant metastases observed in about 50 % of patients. 65 % of pancreatic NETs (pNET) are diagnosed when the disease is already metastatic [3, 4]. There is a high unmet medical need to control tumor growth in patients with advanced (unresectable or metastatic) NET. In patients with advanced NETs, the treatment goal is to control hormone-related symptoms (if the tumor is functional), tumor growth, and prolong overall survival of the patients. Biotherapy with somatostatin analogs (SSAs) remains the mainstay of symptomatic therapy [5, 6]. More recently, the PROMID study has shown that octreotide LAR (long-acting release) increased time to tumor progression (TTP), as compared with placebo, from 6 to 14.3 months in treatment-naive patients with advanced NET of midgut origin . These findings have been confirmed and extended by the recent CLARINET trial with lanreotide , published in 2014. This trial showed a significantly prolonged progression-free survival (PFS) in patients with metastatic grade 1 or 2 (Ki-67 <10 %) enteropancreatic neuroendocrine tumors. Somatostatin analogues can inhibit the tumor growth and stabilize disease irrespective of the hormonal activity of the tumor. Cytoreductive surgery and regional ablation are used with palliative intent in metastatic disease. Local cytoreductive/ablative therapies include hepatic (chemo) embolization, percutaneous ethanol injection, cryotherapy, radiofrequency ablation, and selective internal radiation with Yttrium-90 labeled microspheres . Their impact on survival has to be proven in larger, controlled trials. Peptide radionuclide receptor therapy (PRRT) seems to be a promising treatment option but there are not data available from randomized controlled trials and this therapy is not available worldwide . Chemotherapy was, for years, the only therapeutic option for the treatment of metastatic pNET, with very contradictory results. Considering that Neuroendocrine Carcinomas (NECs) have common embryological origin and similar histologic morphology of small cell lung cancer and Merkel Cell carcinomas, the combination of cisplatin plus etoposide is usually the favorite treatment schedule of poor differentiated neuroendocrine tumors. Although this platinum-based combination treatment had shown interesting results in terms of response rate on undifferentiated NETs , there was a minimal impact on overall survival, so these results remain controversial. Actually the schedule cisplatin plus etoposide is only a virtual standard therapy. The traditional use of this scheme derives from old studies, with little statistical evidences due to the small number of patients enrolled in clinical trials. Therefore it is uncertain that cisplatin and etoposide can be considered the gold standard for the treatment of these tumors. Furthermore other drugs, as gemcitabine, oxaliplatin or temozolomide can be evaluated in the treatment of NEC. Temozolomide (TMZ) is an imidazotetrazine derivative of the alkylating agent dacarbazine, which shows good central nervous system distribution. The use of TMZ is particularly indicated in the treatments of brain tumors, primary central nervous system lymphoma, neuroendocrine and pituitary tumors. TMZ was approved by the Food and Drug Administration (FDA) and European Medicines Agency (EMA) in 1999 for the treatment of multiform glioblastoma and anaplastic astrocytoma in case of recurrence or progression after standard therapy and in 2005 for newly diagnosed multiform glioblastoma in combination with radiotherapy and then as maintenance treatment. The activity of TMZ in patients with metastatic neuroendocrine tumors has been evaluated in several trials [11, 12] which showed an interesting activity in terms of ORR, ranging from 25 to 70 %. [13–21]. TMZ showed a good activity in patients with NETs both in monotherapy both in association with other anti-cancer drugs as capecitabine, bevacizumab or thalidomide. The association of TMZ plus capecitabine showed encouraging results. In vitro data indicate that this combination has a synergistic effect, inducing apoptosis in neuroendocrine tumor cell lines. A retrospective study of 17 patients with pNETs treated with TMZ plus capecitabine showed 1 complete response (6 %) and 9 partial responses (54 %), with a median duration of response of 284 days. All of the patients progressed during first-line treatment with escalating doses of sandostatin LAR, and 11 patients during multiagent chemotherapy (range 1–5 regimens) . Moreover the association of TMZ plus capecitabine resulted particularly active in patients both with well, both with poor differentiated pancreatic neuroendocrine tumours. In a trial reported by Strosberg et al. in 2011 , 30 patients with progressive metastatic pNETs, all chemotherapy-naïve, were treated with capecitabine (750 mg/m2 b.i.d., d. 1–14) plus temozolomide (200 mg/m2/day, d. 10–14) every 28 days. 70 % of the patients achieved a RECIST objective response, median progression-free survival was 18 months, and the 2 years survival rate resulted 92 %. Four patients (12 %) experienced grade 3 or 4 adverse events (Table 1). Therefore, these combination have a promising activity that should be evaluated in further studies with larger cohorts of patients to confirm the efficacy of these and to find the optimal schedule of association with other drugs. An interesting clinical trial from ECOG (ACRIN Cancer Research Group-E 2211) on these issues is ongoing. Traditionally, neuroendocrine tumors have been classified by their anatomic site of origin. NETs can arise in many different areas of the body, and are most often located in the intestine, pancreas or the lungs. The various kinds of cells that can give rise to NETs are present in endocrine glands and are also diffusely distributed throughout the body. But all the NETs have a common embryologic origin from the neural crest. So between the neuroendocrine cancers are included different tumors as small cell lung cancer and Merkel cell carcinoma. In the landscape of anti- tumor therapy, recently the immunotherapy has found a new field of application. Indeed, It has been proven that the tumors may adopt normal physiologic checkpoints for immunomodulation leading to an imbalance between tumor growth and host surveillance. Antibodies targeting the PD-1/PD-L1 checkpoint have shown dynamic and durable tumor regressions, suggesting a rebalancing of the host–tumor interaction. Nivolumab and Pembrolizumab are the anti-PD-1 antibodies that are currently the furthest in clinical development, and anti-PD-L1 agents under investigation include MPDL3280A, MEDI4736, and BMS-936559. These agents have been used to treat advanced melanoma, non-small cell lung cancer, renal cell carcinoma, bladder cancer and Hodgkin lymphoma, amongst other tumor types. In the treatment of small cell lung cancer (SCLC), an aggressive neoplasm thought to be arising from lung neuroendocrine cells, several trial are ongoing to investigate PD-L1 and PD-1 expression patterns and the role of anti-tumour immunotherapy such as blockade of co-inhibitory immune pathways PD-1/PD-L1. Ott and others  have observed, in the ongoing trial Keynote-028, that, in the treatment of patients with PD-L1 + SCLC who have progressed on prior platinum-based therapy, Pembrolizumab is generally well tolerated and, therefore, has promising antitumor activity. In fact, it has been demonstrated that out of the 135 patients with SCLC screened, 37 (27 %) had PD-L1 + tumors and of 16 treated with pembrolizumab (Pembrolizumab 10 mg/kg every 2 weeks for up to 2 years or until confirmed progression or unacceptable toxicity), 4/16 (25 %) evaluable patients had a partial response. Pembrolizumab has promising antitumor activity also in the treatment of Merkel cell carcinoma (MCC). MMC is an aggressive neuroendocrine carcinoma of the skin, which can be distinguished from other malignancies by its expression of cytokeratin 20. Meantime, it is already known that, in cancer immunotherapy, dendritic cells (DCs) play a fundamental role in the dialog between innate and adaptive immune response, but several immunosuppressive mechanisms remain to be overcome. For example, a high number of CD4 + CD25 ++ Foxp3+ regulatory T-cells (Foxp3 + Tregs) have been observed in the peripheral blood and tumor microenvironment of cancer patients. On the basis of this, Ridolfi and others  conducted a study on DC-based vaccination in advanced melanoma, adding low-dose temozolomide to obtain lymphodepletion. They founded that the combined immunological therapy, at least as far as the DCR subgroup is concerned, effectively reduced the number of Foxp3 + Treg cells, which exerted a blunting effect on the growth stimulating effect of IL-2. However, this regimen, with its current modality, would not seem to be capable of improving clinical outcome. 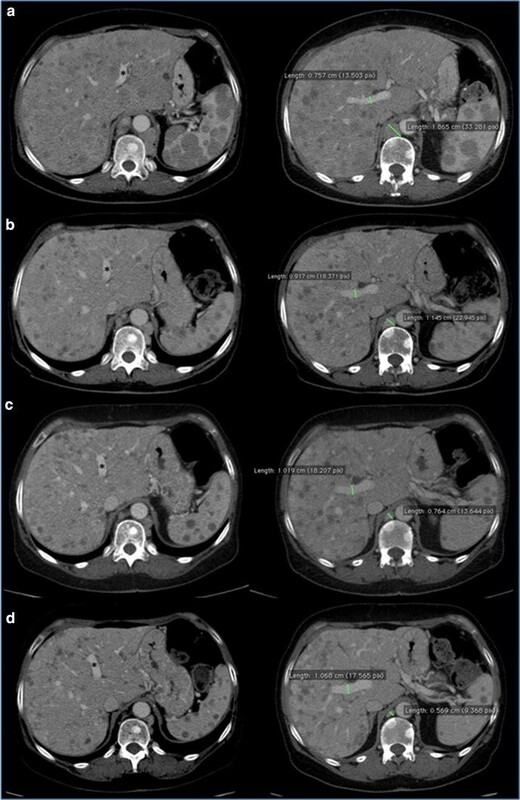 Here we present a case of a patient with poor Performance Status (PS), affected by a pancreatic neuroendocrine tumor, progressing after a first line of therapy with cisplatin plus etoposide, achieving a clinical and radiological response with metronomic temozolomide “one-week-on/on-week-off regimen”, with continuing tumor shrinkage at 18 months from the beginning of the treatment. The intermittent dosing was chosen to reduce the frequency and severity of hematologic toxicity of TMZ as compared with more extended dosing schedules such as the 21/28-day or extended daily schedules, and for the poor Performance Status (PS = 2) of the patient at the beginning of the treatment. According to the present knowledge it wouldn’t be rash to claim that the treatment with TMZ can develop mechanisms of induction of the immune response, especially with metronomic schedule. On September 2012 a 57-year-old female patient, due to repeated episodes of heartburn and dyspepsia, underwent endoscopy examination of the stomach that diagnosed the presence of gastritis with duodenal ulcer and Helicobacter Pilory (HP) infection. Blood tests showed an increase of AST, ALT and amylase. She also practiced an abdomen ultrasound that resulted negative for metastatic lesions. Therefore, was prescribed antibiotic therapy for HP eradication and introduced a regimen with protonic pump inhibitor (PPI). 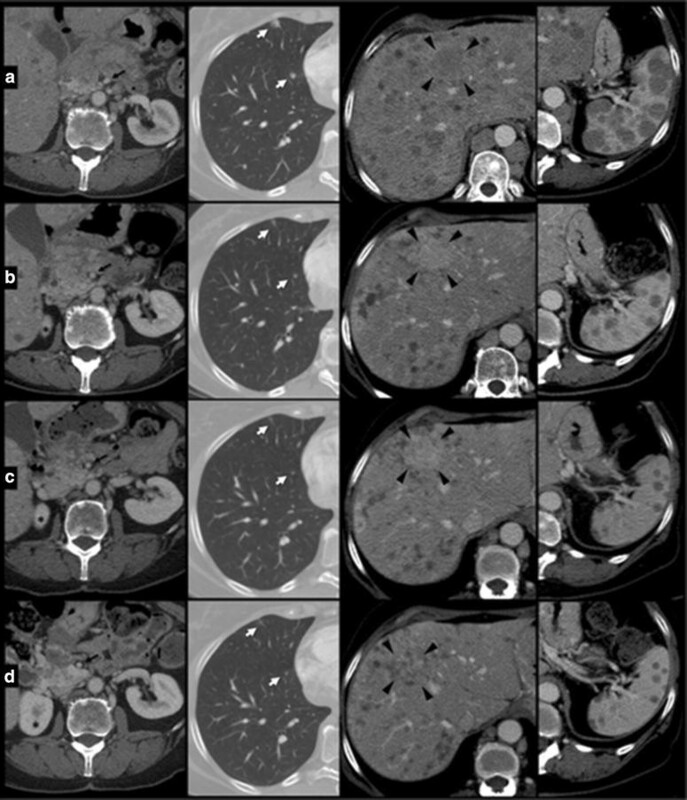 On July 2013, due to the worsening of nausea and vomiting was performed a total body CT-scan, which evidenced the presence of an advanced neoplasia of the pancreatic head with lymph nodal, liver, spleen and lung metastases. Hematology showed high levels of chromogranin A up to 371.0 U/L (n.v. 2.0 to 18.0) and 5HIAA up to 18 (<8). Then a liver biopsy under ultrasound guidance was performed. The histological examination diagnosed the presence of a poorly differentiated, endocrine-small cell carcinoma, (NEC) (CD56+; chromogranin +, synaptophysin +, CK7−; Ki67 >20 %) (Fig. 1) and also detected peritumoral lymphocytes and leukocytes infiltrating tumor micro environment (Fig. 2). An OctreoScan performed on July 18 2013 showed the presence of hypermetabolic indicator receptor on the right subclavian region, retrotracheal, subcarinal, epi-mesogastric region (pancreas and lymphnodes), on multiple areas of the liver and on some skeletal sites (skull, dorsal vertebra and pelvis). A PET-FDG practiced on July 20, 2013 showed pathological uptake at the pancreas (SUV max 4), at some liver lesions (SUV max 3) and at multiple skeletal localizations, in particular on the right humerus, on D4 and on the left acetabulum. On July 27 2013, the patient arrived at Our Institute presenting highly symptomatic disease (vomiting G2, diarrhea G2, heartburn); laboratory tests showed elevation of AST (=93), ALT (=156) and GGT (=321). Therefore on July 20 2013 was prescribed treatment with octreotide LAR 30 every 4 weeks (q28) and on July 31 2013 the patient started a first-line chemotherapy with the combination cisplatin plus etoposide. On March 2014 after six cycles of chemotherapy, the patient underwent total body CT-scan that showed radiological stable disease, with clinical response for the resolution of the disease-related symptoms and normalization of liver function tests. The patient continued the treatment with octreotide LAR 30 q28 but on June 2014, after three months of therapy there was a clinical progression of disease with worsening of performance status (ECOG PS = 2). If the first line of chemotherapy in neuroendocrine carcinomas with cisplatin and etoposide is not a real standard therapy, a second line therapy for NEC progressing patients does not really exist. Thus, considering the poor clinical status, we prescribed a treatment with temozolomide 75 mg/m2 “one week on/one week off”. On July 2014 the patient started the treatment. Metronomic temozolomide was well tolerated and no drug-related side effects were reported by the patient. The detection of MGMT methylation, by MSP and MethyLight qMSP, resulted positive (Fig. 3). On August 2014, the patient had a significant clinical benefit with improvement of performance status (ECOG PS: 0). The total body CT-scan performed on October 2014 evidenced a RECIST partial response (Figs. 4, 5, 6) with reduction in number and volume of liver and spleen metastases, reduction of hepatomegaly and splenomegaly, reduction of periesofageal, retrocrural and lomboaortic lymphnodal metastases, reduction of lung metastases, disappearance of ascites, significantly reduction of the lesion of the pancreatic head. The patient continued the treatment and the total body CT-scan performed on January 2015 showed once again the persistence of the framework of further instrumental disease response, on lung, liver, and multiple lymphnodal metastases. Then, given the response both clinical and radiological and considering the improvement in quality of life and Performance Status achieved by the patient, we continued the treatment with temozolomide at the same dosage and regimen. In April 2015, the patient, stable for clinical conditions (PS = 0), with very good quality of life, performed a new total body CT-scan (Figs. 4, 5, 6) which showed an unexpected, further partial response. Treatment with TMZ is still ongoing. Despite new promising therapeutic strategies in the setting of G1 – G2 pNET, recurrent or metastatic pancreatic Neuroendocrine Carcinoma (pNEC) continues to be an incurable disease with poor prognosis and there is no standard option for second line chemotherapy. Ongoing clinical trials are testing the efficacy of immune modulating antibodies against the PD-1/PDL-1 pathway (i.e. Avelumab in Merkel Cell Carcinoma) in pre-treated, progressing neuroendocrine tumors (NCT01772004, NCT01375842). Few prospective studies that investigate a second line chemotherapy in neuroendocrine tumors are available. In 2011 Welin et al. showed that Temozolomide may be an active, well tolerated, second-line chemotherapy regimen for NEC patients (mainly gastrointestinal) who have progressed after first-line chemotherapy. It seems to be effective also in lung carcinoid. Early clinical studies [26, 27] investigating shortened and extended dosing schedules suggested that continuous daily administration of temozolomide resulted more effective than a single dose. More frequent administration (e.g., twice a daily) yielded higher levels of O6-methylguanine DNA adducts, suggesting that the capacity of tumor cells to repair these adducts can be saturated. Unfortunately, hematologic toxicity was dose limiting of some schedules. In Glioma, it has been suggested that intermittent dosing (one week on/one week off treatment) may reduce the frequency and severity of hematologic toxicity compared with more extended dosing schedules such as the 21/28-day or extended daily schedules . Several studies  have shown that prolonged exposure to temozolomide can deplete MGMT activity in blood cells, a process that could potentially increase the antitumor activity of the drug. To date, however, there are limited data demonstrating the depletion of MGMT activity in tumor tissue exposed to temozolomide. Wolfgang  et al. studied in patients with glioma the effects of the treatment with either an alternating weekly schedule (7 days on/7 days off) or for 21 consecutive days every 28-day cycle (21/28-day schedule) on MGMT enzyme activity assayed in peripheral blood mononuclear cells (PBMCs). The results showed a time- and dose-dependent decrease in MGMT activity with both regimens. A variety of dosing schedules that increase the duration of exposure and the cumulative dose of temozolomide are currently being investigated for the treatment of glioma, with the goal of improving antitumor activity and overcoming resistance [29–32]. These alternative dosing regimens have been shown to deplete MGMT activity in peripheral blood mononuclear cells, but the regimen that provides the best balance between enhanced antitumor activity and acceptable hematologic toxicity has yet to be determined. According with these considerations, we decided to use the regimen “Seven-Days-On/Seven-Days-Off Regimen” because it appears to reduce the frequency and severity of hematologic toxicity as compared with more extended dosing schedules such as the 21/28-day or extended daily schedules. In our case, we treated a metastatic pNEC patient, progressing after a first line platinum-based chemotherapy, with metronomic regimen (75 mg/m2/day) of temozolomide “one week on/one week off”. After 1 month of treatment, a clinical response, with regression of disease-related symptoms and performance status improvement from ECOG PS 2 to 0 was obtained. After 3 months of therapy a RECIST partial response was observed. The treatment was well tolerated without drug-related side effects. After 18 months of therapy the partial response goes on. Though on the tumor samples of patient the detection test of MGMT methylation was positive, we think that this result cannot be due only to the action of the alkylating drug, but needs immunological implications of the chemotherapy. Conventional anticancer chemotherapy is generally thought to act through selective killing of tumor cells or by irreversibly arresting their growth. Cytotoxic drugs act in different phases of cell cycle interfering with DNA synthesis, or inducing a damage on DNA, leading to tumor cell death. Always more evidences indicate that several chemotherapeutic agents are more active against tumors implanted in immunocompetent hosts as compared with tumors in immunodeficient hosts. This clearly indicates the existence of a correlation between the activity of chemotherapeutic agents and the hosts’ immune system . Pilot clinical trials with cancer vaccines gave clear evidence of the positive impact of chemotherapy on antitumor immune responses. Gene expression analysis of peripheral blood mononuclear cells (PBMCs) from melanoma patients treated with dacarbazine and a peptide-based vaccine revealed, by one day after chemotherapy, increased expression of immunoregulatory factors that can account for the enhancement of tumor antigen-specific CD8 T cell responses observed in those patients, as compared with patients treated with vaccine alone . Together with these effects were resulted a widening of the antigenic repertoire and an expansion of antigen-specific T-cell tumor reactivity . Moreover cancer often results in an imbalance of Th1/Th2 immunity, which can be restored by some antineoplastic drugs. Besides the active stimulation of effector cells, immune-potentiation by cytotoxic chemotherapy can also be achieved through the inhibition of tumor-induced immune suppression. Several subsets of immunoregulatory cells have been identified so far in cancer patients . CD4-CD25-expressing Tregs and myeloid cells with suppressive functions, namely myeloid-derived suppressive cells (MDSCs) and tumor-associated macrophages (TAMs), accumulate in the blood and, especially, within tumor burden, thus contributing to disease progression through various mechanisms. Gemcitabine kills MDSCs, both in vitro and in vivo [36–38] with no significant reduction in other cell subsets. The selective loss of MDSCs was accompanied by an increase in the antitumor activity of CD8 T and NK cells. It has been demonstrated that metronomic temozolomide, reduces the number and the suppressive function of circulating Tregs in rats bearing glioma, although it did not restrain tumor growth . Under defined circumstances, chemotherapy-induced tumor cell death can set the stage for an effective antitumor immune response. In fact some chemotherapeutics, including anthracyclines, oxaliplatin and CTX, are unique in their capacity to induce an immunogenic type of tumor cell death [40, 41] thereby converting dying tumor cells into adjuvanted-endogenous vaccines. An interesting thing to mention is that, the count of lymphocytes (ALC) and monocytes (AML) in blood samples of our patient has been evaluated, during these months. There has been an initial increase and a subsequent stabilization of these values over time (Table 2), and this is in line with the above hypothesis. Chemotherapy agents have a significant impact on both tumor and host immune system. Even if no systematic analysis has been performed to evaluate differences in the immune-based effects of conventional chemotherapeutic agents depending on cancer histology or stage, it is now clear that the existence of tumor–host interplay influences the magnitude, quality and efficacy of most anticancer strategies. Advances in tumor immunology have now explained some key mechanisms that represent the basis of therapeutic synergy with other treatments. In our clinical case, the continuous response after 18 months of treatment, associated with the clinical benefit obtained, indicate a plausible immune activation induced by metronomic temozolomide. Moreover this case report highlights the efficacy and tolerability of this regimen even in a patient with poor performance status and in this particular category of neoplasms, opening new scenarios of treatment for metastatic pNET. Therefore, this regimen has a promising activity that should be evaluated in further studies to confirm the efficacy and safety of temozolomide as second-line treatment of Gastro-entero-Pancreatic Neuroendocrine Carcinomas progressing after first-line Platinum-based therapy, especially in selected patients, such as those who have levels of MGMT methylation. A phase II clinical trial using temozolomide as second line of NEC progressing after platinum-based first line chemotherapy, has been designed (TENEC trial). 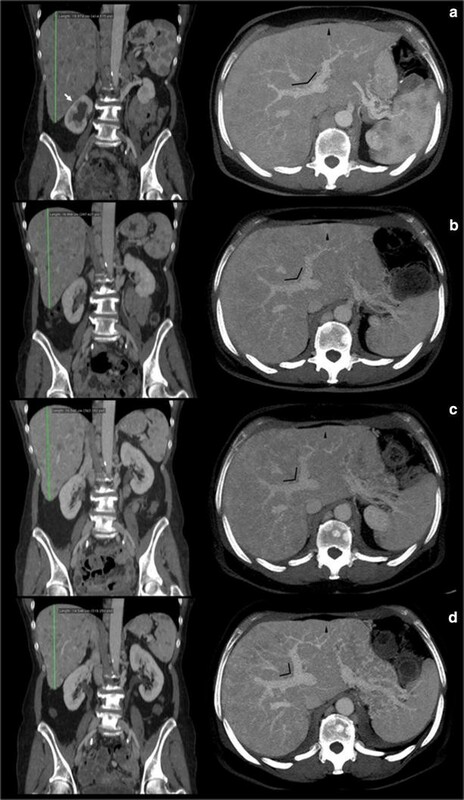 This case report highlights the efficacy and tolerability of metronomic temozolomide even in this particular category of neoplasms and in this therapeutic setting, opening new scenarios of treatment of metastatic pNET. Therefore, this regimen has a promising activity that should be evaluated in further studies to confirm the efficacy and safety of Temozolomide for second-line treatment of Gastro-entero-Pancreatic Neuroendocrine Carcinomas progressing after first-line Platinum-based therapy, especially in selected patients, such as those who have levels of MGMT methylation. Recently, a phase II study TENEC, temozolomide as second line of NEC in progression after platinum-based first line, at our Institution was started. All the authors contributed to the elaboration of this reviews. CDD, CVA have made substantial contributions to acquisition, analysis and interpretation of data; CDD, CVA, AG have been involved in drafting the manuscript and revising it critically for important intellectual content and in the revision of the manuscript; ES, FT, DC have provided histological and radiological figures of patient and they have analysed them; ST, GMR, RVI have treated patient; ST, PAA have participated substantially in revision the manuscript. AA has worked about detection of MGMT methylation. All authors have given final approval of the version to be published. We thank Prof. A. Gallipoli D’Errico and the association Lega Italiana Per La Lotta Contro i Tumori (LILT) of Naples in Italy for the close collaboration. All the authors declare that there are no competing interest that could be perceived as prejudicing the impartiality of the data reported. DNA extraction and bisulfite treatment. To ensure high tumour DNA content, FFPE tissue sections were stained with H&E and histologically examined by an expert neuropathologist Sections showing a tumour cell content of more than 80 % were directly subjected to DNA extraction.. Extraction of genomic DNA was performed using the QIAamp DNA Mini Kit (Qiagen, Hilden, Germany) and quantified with a NanoDrop ND-1000 (PeqLab, Erlangen, Germany). One micrograms of extracted DNA as well as CpGenome Universal Methylated DNA (Chemicon International, Temecula, CA) and CpGenome Universal Unmethylated DNA (Chemicon International) as controls were subjected to bisulfite treatment using the EpiTect Bisulfite Kit (Qiagen). The bisulfite-treated DNA was used for Methylation-specific polymerase chain reaction (MSP//PCR). The two primer sets established by Esteller et al. for MSP of MGMT  were 5′-TTTCGACGTTCGTAGGTTTTCGC-3′ (forward primer) and 5′-GCACTCTTCCGAAAACGAAACG-3′ (reverse primer) for methylated template detection (M primers, product length 81 bp; and 5′-TTTGTGTTTTGATGTTTGTAGGTTTTTGT-3′ (forward primer) and 5′-AACTCCACACTCTTCCAAAAACAAAACA-3′ (reverse primer) for unmethylated template detection (U primers, product length 93 bp;. The PCR was performed in a total volume of 20 µl containing 10 µl HotStarTaq Mix (Qiagen), 1 µl of the respective forward and reverse primer (10 mol), 6 µl high purity water and 2 µl bisulfite-treated template DNA. The PCR programme was 95 °C for 15 min, then 35 cycles of 95 °C for 50 s, 59 °C for 50 s and 72 °C for 50 s, followed by a final step at 72 °C for 10 min. PCR reactions with CpGenome Universal Methylated DNA (Chemicon International), with CpGenome Universal Unmethylated DNA Vial A (Chemicon International), and without any DNA (non-template control) were included as controls. PCR products were separated on a 2 % agarose gel.